The setting: The CanJam tent at the Rocky Mountain Audio Fest 2016. “Have you heard Audeze’s new planar magnetic headphones?” blurted an excited friend and colleague from Head-Fi. “They’re in-ears, if you can believe that!” In order to understand my colleague’s self-evident wonderment, it helps to know that Audeze built its entire reputation by building high-performance, full-size planar magnetic headphones. First came the premium-priced LCD-series models, then the mid‑priced EL-8 models, and finally the affordable Sine-series headphones—all of them full-size models. What no one saw coming was a family of compact, full-range planar magnetic universal-fit earphones. Full of curiosity, I headed straight over to the Audeze demo station where I discovered the firm’s all-new iSINE-series planar magnetic earphones, which looked and sounded very distinctive indeed. There are three models in the iSINE range: the virtual-reality system-orientated iSINEVR ($399), the iSINE10 (£349), and the top-of-the-range iSINE20 (£549), which is the subject of this review. Interestingly, both the iSINE10 and iSINE20 earphones can be ordered either with standard signal cables or in special bundles that also include the Audeze’s iPod/iPhone/iPad-compatible CIPHER cable with a compact, built-in DAC/amp/DSP module (for a £50 upcharge). Our review sample iSINE20 included the CIPHER cable, whose benefits we will discuss in a moment. As I mentioned above the iSINE20 does not fit within the wearer’s outer ears, but rather is worn alongside the ears, with mesh vents facing outwards, and with rear-mounted, tapered sound outlet tubes facing inwards and extending into the wearer’s ear canals. The earpieces are very light (about 11g per side, without cables) and are designed to be held in position either by sets of plastic ear hooks or by in-ear ‘earlocks’—both of which ship with the iSINEs. From the wearer’s point of view the sensation is that the iSINEs are ‘floating’ in close proximity to one’s ears, but with light-fitting and comfortable sound outlet tubes directing music into the ear canals. The sound outlet tubes are fitted with silicone ear tips as with conventional earphones, but the ‘feel’ of the iSINE20 is considerably different—with a noticeably lighter fit and lower backpressure within the ear canals. 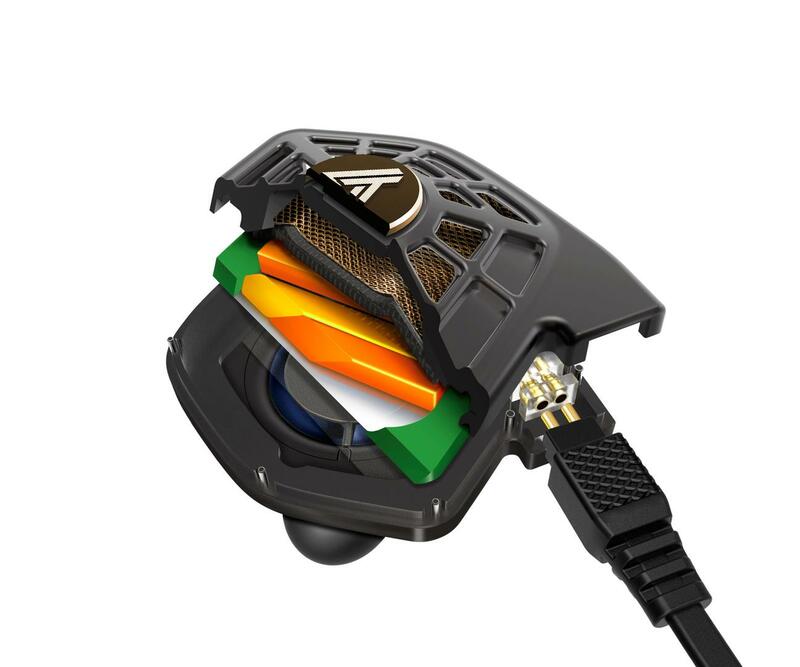 The iSINE20’s feature 30mm planar magnetic drivers that leverage three technologies drawn from Audeze’s full-size models: namely, Fluxor magnet arrays, Uniforce voice-coils, and Fazor-type waveform control elements. Fluxor magnets use high-grade Neodymium materials to create powerful, tightly focused magnetic flux fields within the driver, reducing weight while increasing efficiency. Uniforce voice-coils use distinctive variable trace widths to equalize drive forces across the working surface of the planar diaphragms. One differentiator between the iSINE10 and the iSINE20 is that the latter features “an even longer Uniforce voice-coil that covers the ultra-thin diaphragm to a greater extent, enabling better control and responsiveness.” Fazor elements act as waveguides with sonic benefits said to include extended high-frequency response, “better phase response, and lower distortion resulting in enhanced imaging.” Finally, the iSINE20 features light, responsive ‘nano-scale diaphragms’ made of a film-type aerospace material thinner than a human hair.